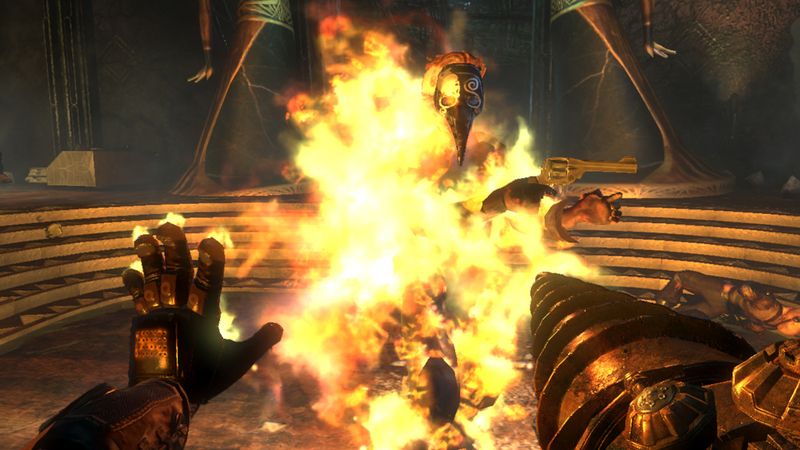 The Refined Geek » Bioshock 2: Morbidity, Mortality and Morality. Bioshock 2: Morbidity, Mortality and Morality. Not matter how big or small of a game developer you are sequels are one of those things that are hard to get right. If you leave your initial game deliberately open ended in order to accommodate for the possibility of a sequel you’re instantly labelled as a sell out and the ending will often feel hollow for the player. However should your game do well and you completely close off the option for a sequel all together you miss out on what could be quite a prosperous business opportunity, something which most publishers won’t allow. Still despite this tricky balancing act many sequels have graced our paths over the last few months (such as Uncharted 2, Assassin’s Creed 2 and Mass Effect 2) that managed to have a well rounded first game that lent themselves quite well to a sequel. Bioshock 2 is yet another sequel that was expected but not required to finish off the story of its predecessor and after a couple days of intense gaming I managed to finish it late on Friday night. Before I get into the meat of the review I want to point out the phenomenal effort that went into designing and creating the collector’s edition of Bioshock 2. The original collector’s edition (which I sadly missed out on) was never initially planned and only after garnering 5,000 online signatures in under 5 hours did 2K relent and create one, but it was far from a rushed effort on their part. For the sequel they’ve really outdone themselves and when I picked up my copy I was extremely surprised at the weight the box carried and upon opening it at home I was greeted to a wealth of collector goodies. 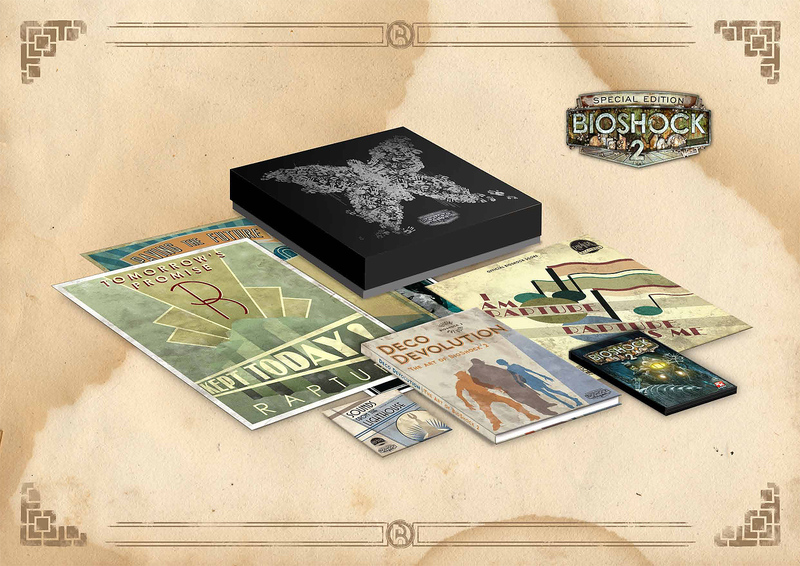 The art book and box are absolutely gorgeous and the posters have that distinct steampunk feel to them that gives you that feeling of having just a little bit of Rapture here in the real world. Whilst I’ve yet to play the EP its inclusion in the box set rounds off the whole “old but new again” feeling this collector’s edition gives off. This was definitely money well spent. Bioshock 2 thrusts you back into the underwater world of Rapture 8 years after the events that occurred in the original as the original Big Daddy. The opening events of the game are a brutal representation of the seething evil that infested Rapture and instantly sets up your arch rival as well as your end goal. I must say it was one of the best orchestrated openings I’ve seen in a game in a long time as it raises so many questions that you’re instantly hooked, just waiting for the next bit of information so you can unravel your past that has been hidden from you. The interface of Bioshock 2 will be instantly familiar to veterans of its prequel, save for a few key differences. For myself it was a bit of a struggle for the first half hour or so as I played the original on the Xbox 360 and this one on the PC. However after a while it all flows quite naturally and the augmentations to the combat system, namely the ability to use plasmids and guns at the same time, make for some very gripping combat scenes. Initially I was dreading many of the large fights as I felt I was constantly scrounging for ammo, first aid kits and eve hypos. However after a couple hours and some good plasmids under my belt I came to relish the larger fights of the game that really pushed me to the limits of how capable I could be. The tonic and plasmid slot system makes a return in Bioshock 2 with some distinct overhauls. The three levels of plasmids not only increase their strength but also morph them with additional properties. The tonics have also been revamped allowing for some pretty hefty customization of your character. In the end my character ended up being a drill wielding maniac with 2 heavy security bots at his side constantly, but there were at least a dozen more very viable builds available, each with their own benefits. There’s no shortage of gene banks around the place so if you get bored of your current build you’re never more than 5 minutes away from changing it up for a refreshing change of pace. 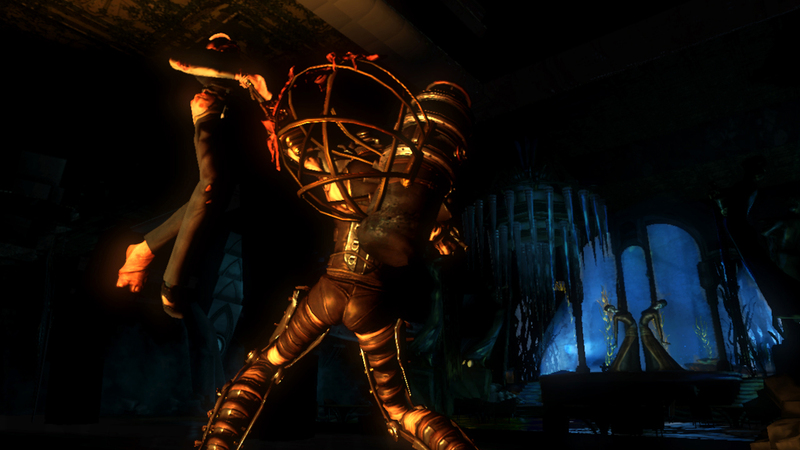 Two more notable changes have occurred to the game play of Bioshock 2. The first is the hacking system which instead of the Pipe-Mania-esque get the fluid from one side to the other mini-game to a quicker click at the right time puzzle. It was a good change as hacking doesn’t break the immersion as much and is over a lot quicker than it was in the original. The second is the removal of the U-Invent stations so you won’t be building your own ammo in this game, but you also won’t be dealing with a innumerable number of useless items just to make a few explosive shotgun shells. 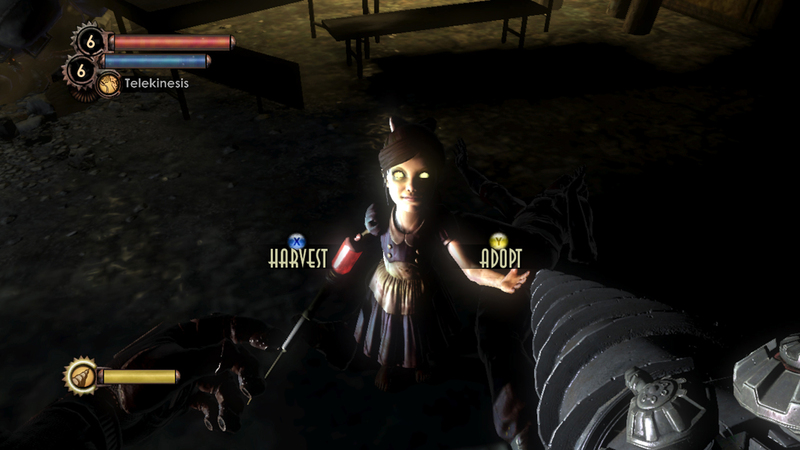 The simple moral choice system is back in Bioshock 2 with a slight difference. Since you’re now a Big Daddy the Little Sisters will trust you implicitly, that is once you take care of their current Mr B. Adopting one of these little critters lets you harvest Adam from bodies around Rapture and, should you wish to, you may still harvest them once you’re done collecting. Being an upstanding gentleman I couldn’t bring myself to harvest them and saved every single one of them. Sure its a simple binary choice but I always had a warm fuzzy feeling every time I heard their timid voices eek out a “thank you” before struggling to get back into the vent. There are some additional moral decisions peppered throughout the game which will affect the final climax of Bioshock 2. Again they are still binary in nature although which one is good and which one is evil gets a little blurry at times, which is obviously the intention. Whilst I doubt a Bioshock 3 would take a cue from Mass Effect and let you import a save from a previous game (for reasons that are too spolierific to post here) the decisions would seem to have a longer lasting impact on the world of Rapture than just your little sojourn through there. Time will tell if I’m wrong about this however. All of this would have been for naught had the story not lived up to its predecessor. To be honest the beginning had me confused for a good while as I struggled to make sense of the situation my avatar in Rapture had been thrust into. However the storytelling techniques used in the first Bioshock served its sequel well with many interesting plot points revealed to those who would seek out every corner of Rapture, usually in the hopes of ammo and supplies. The story begins extremely slowly and initially I became frustrated with what felt like an artificially slow moving game. However the final 2~3 hours are amongst some of the most gripping and intense gaming experiences that I’ve ever experienced. When a game can invoke in you a real sense of urgency, panic and fear you can’t help but become trapped in the world that they created. The ending (for comparison mine was the “good” ending) was bitter sweet enough to draw me to tears. It’s not your typical Hollywood ending and that’s exactly the reason why it had such an impact. If anything the game is worth it just for those final 5 minutes you spend seeing the ends of all your efforts throughout Rapture and for an old softie like myself it was just enough to tip me over the edge. It says a lot about Bioshock 2 that the criticisms that I’m going to level at it are really just nitpicking. The use of the train system to transition levels, whilst I can understand the decision from a design point of view, felt a little cheap when compared to the original Bioshock. The research system upgrade was a decent idea however I always found it a little awkward to use in the heat of battle. Lastly whilst I haven’t given the multi-player a go yet the replay value in Bioshock is quite small, as you can try out most of the tonic/plasmid combinations in a single play-through. Overall though these are very minor issues of a very well developed game. It’s not often that we get a game as good as Bioshock that has a sequel that does it justice. Us gamers have been spoiled (and will continue to be) with many great sequels in the recent past and I’m glad I can count Bioshock 2 amongst them. Even if you didn’t play the original there’s definitely something to be had in just playing Bioshock 2, although you’ll miss some of the fan service that makes games from 2K well worth playing. Bioshock 2 is available for PS3, Xbox360 and PC right now for AU$108, AU$108 and US$79.99 respectively. Game was played on PC on hard difficulty saving all the little sisters with around 10 hours of playtime total.